It has been a very busy month. 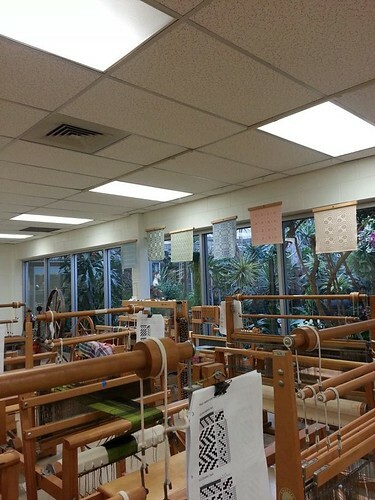 With the 1st level of weaving classes ending, I signed-up for the winter session and tried to get as much loom time as possible. My oh-so-fun twill sampler needed attention. 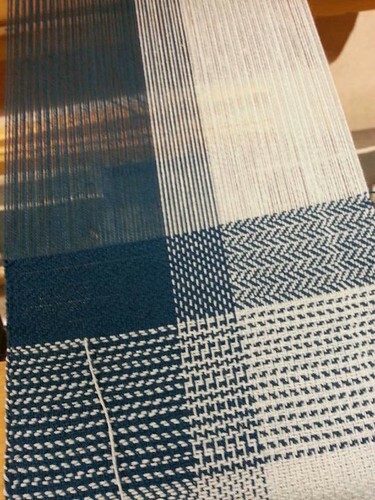 It has 6 twill structures in the 2 blues. Even as someone who would skip sampling whenever she can get away with it, I found this to be an excellent exercise. 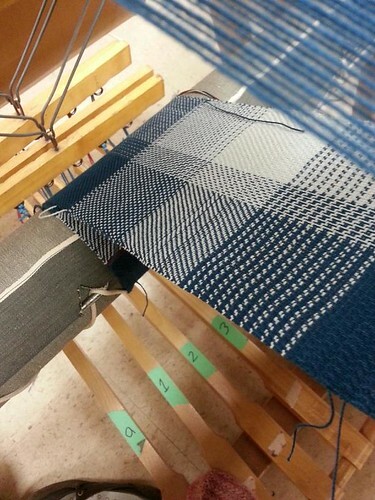 Just having the dark/light warp threads alternate in the middle gave each structure such a radically different look. It’s not something I would have understood without doing. Going to the studio in daytime was very cool. The lighting is great, and whenever guild members were around they were friendly & engaging. The beauty of this class is that we didn’t stop at samplers. We had a first project choice of tea towels or scarves. 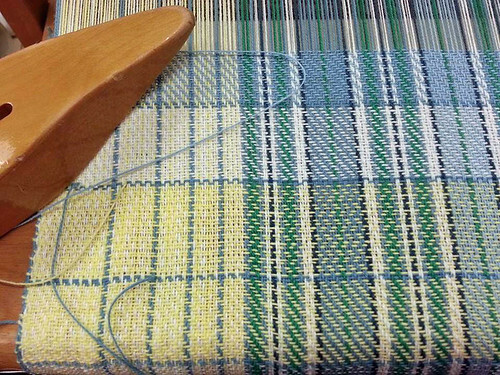 After Beth convincingly said, “Go for it!” I chose the plaid windowpane towels that one of our instructors, MargaretJane Wallace designed. Beth has seen some of these pictures already but that’s 5 colours plus 2 wound together! 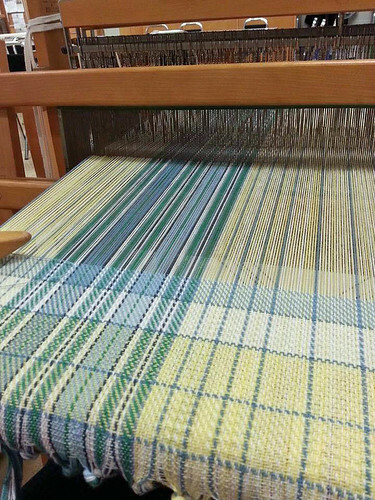 First tea towels warp finally beamed! Both winding the warp-of-many colours, and beaming gave me many lessons in yarn management. MargaretJane helped me work past the tension issues. It amazed me how well-behaved the darks were when the yellow & white warp threads barely co-operated. There was tangling due to pills, sagging, and the left side was just fine. I like what you have done there, Lara. It’s going to make for lively towels. What?! She had spotted the sequence a mile away – I only had one warp stripe in light blue. It’s true, you can see it too. My towels won’t have the precise symmetry within a left-side only plaid’s asymmetry. Oops! We all laughed together, and it’s not a big deal. 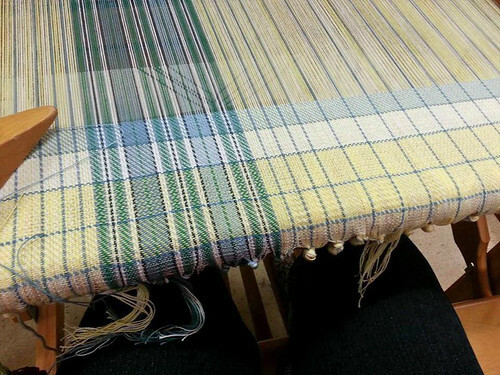 The first step after threading was to experiment with weft colour, and twill structures for this plaid counterpane deal. With so many colour-changes ahead, I decided on a straight 2/2 twill. 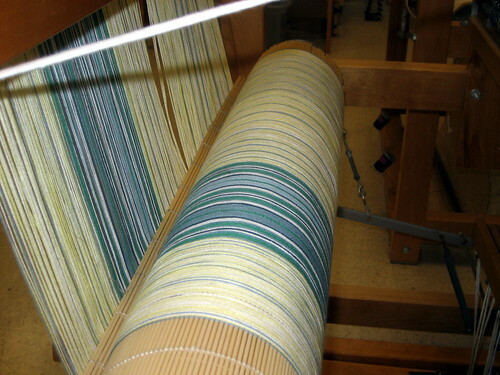 A warp-faced twill was tempting but I didn’t want to fight the counter-balance loom’s action. 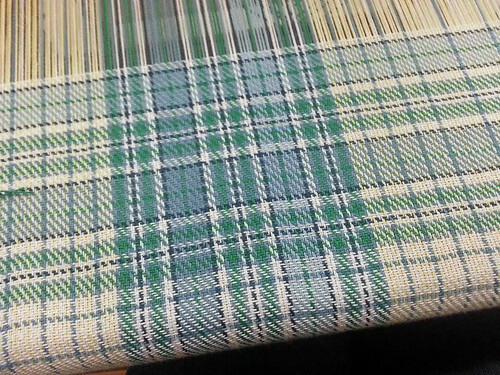 Back at home, I was pouring over a set of new weaving books for insight on plaid, twill, and everything weaving. After much thought, I went with a white ground for the 1st (of 4) towel. It wasn’t long before I decided to play with the counterpane, and framed the plaid with the poor, neglected light blue. This is much different to the knitting process but somehow it feels right. 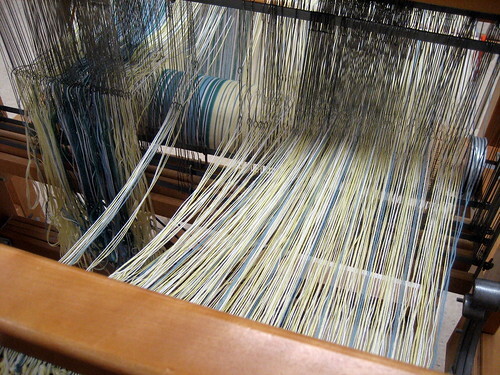 I am reading, watching videos on loom maintenance & weaving well, and generally stretching myself. What cut a lot of the effort short was the late fall weather. 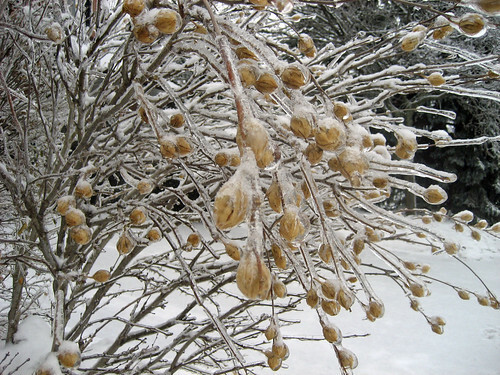 You may have heard about our late fall weather? 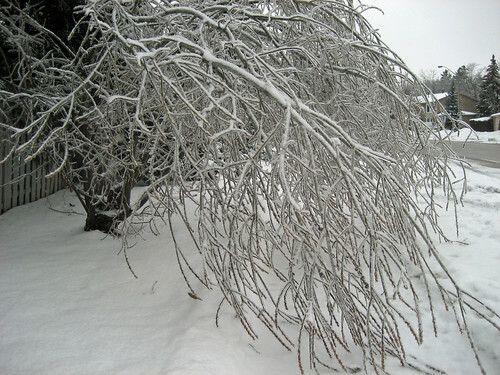 First there was a massive snowstorm on December 14th. Much shoveling ensued. 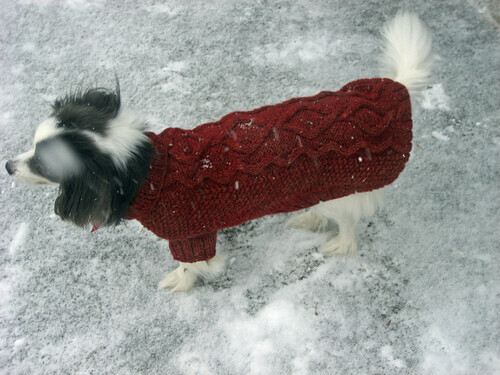 Toby seemed happy for his hand-spun 4-ply Coopworth wool sweater. It kept snow off his big-dog chest. 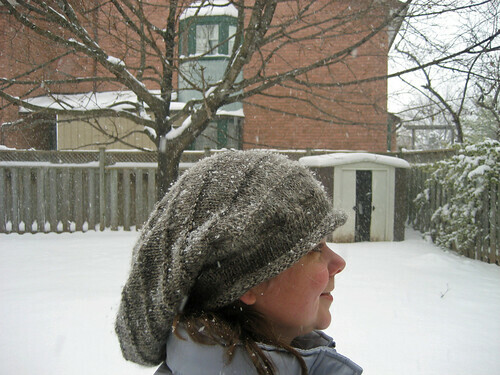 Such was the snow that I used my new hand-spun (from fleece! spindles!) tam. There is a maker’s story behind this but for now, I will just say 1 thing: ears are covered! 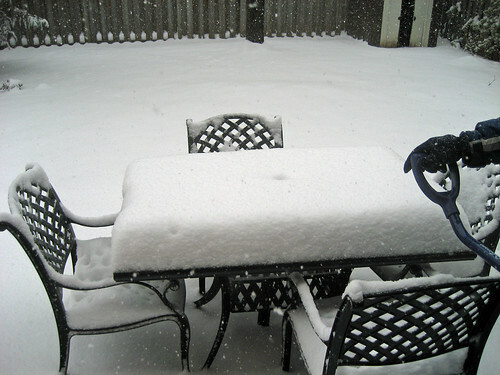 All that snow was really just a chance to knit (more later when pics are taken). 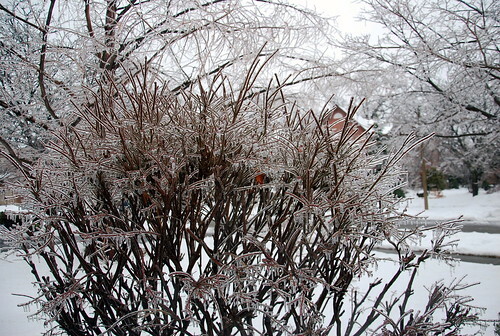 Trouble hit with the ice storm a week later. As in the weekend before Christmas. 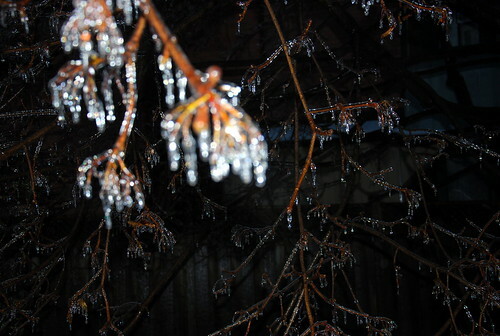 It was my first experience of freezing rain, and an ice storm. 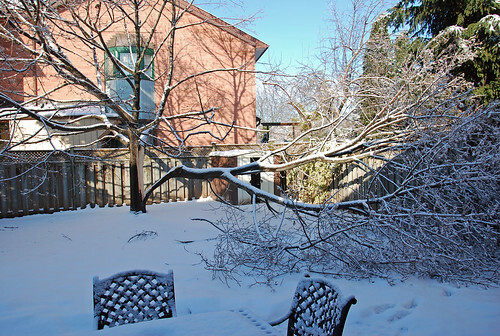 By mid-morning we heard a tearing crash, bang as our Norway Maple’s heavy side fell under ice & hit the fence. We are still waiting for the arborist to arrive. 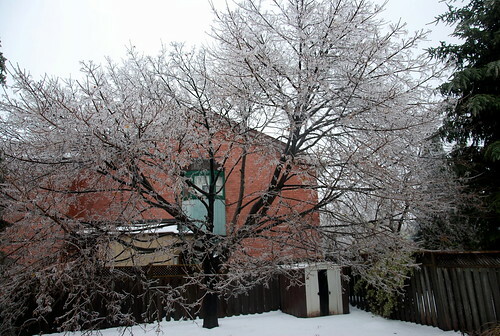 This Norway Maple tree dominates the backyard in all seasons. 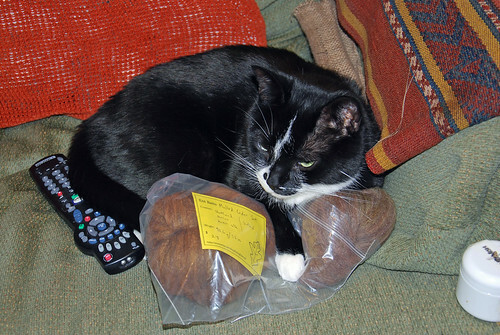 She is in so many of my pictures for The Knit Knack’s posts. It’s a wrenching sight, and impossible to avoid seeing. For that sadness we did not loose power as others did, and the house is intact. The dangerous beauty has thankfully melted at last. It could have been so much worse. Hearing the wind in the icicles was so very eerie. It was perfectly quiet except for the chak-chak of the trees. 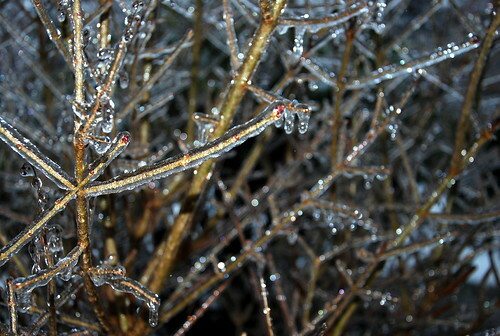 Three days later on Christmas the world was still bent under the ice. Melvin really liked my new batts from Enting Fibercraft. We had to talk quietly about how cats are allowed to look but not touch even pretty fibre. 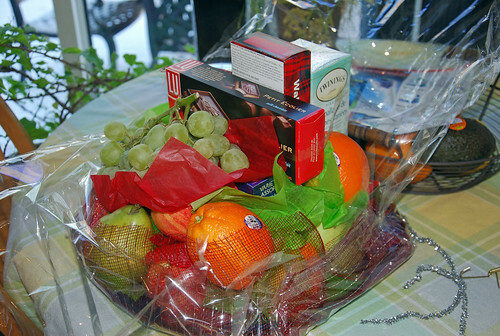 Friends & family have surprised us with baskets of treats – each wonderful in its own right. This was the first through the door. We are still in stay-cation mode with a house guest. 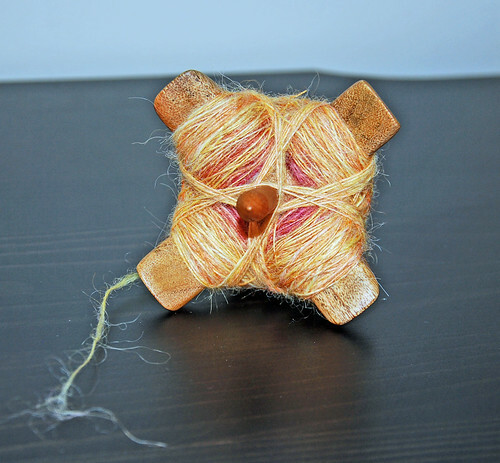 Although a wheel would cramp everyone’s space, I am spinning up a storm on my drop spindles. Happy New Year when it comes, y’all! Categories: Getting the knack, Holidays Happen, Spinning, Weaving, What I'm up to | Tags: cotton yarn, Flora, handspun yarn, Hat, Materials, wool slippers | Permalink.